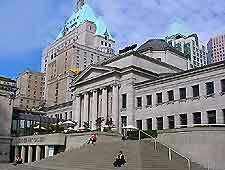 View of the historic Art Gallery building, with almost 8,000 works of art on exhibit. 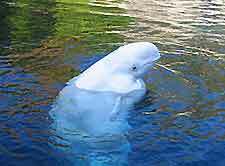 Beluga whale at the city's aquarium, a popular attraction for all ages. 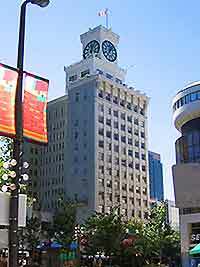 One of the notable Bentall buildings, in the downtown district. 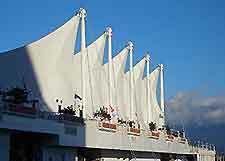 Sail structures at the Canada Place facility on the waterfront, featuring the city's Convention and Exhibition Center. 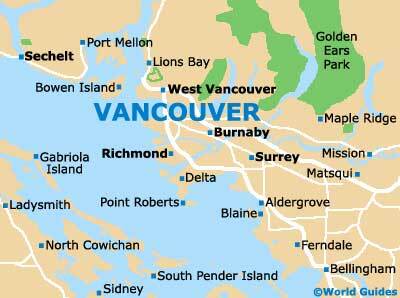 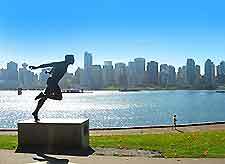 Coal Harbor area, which stretches from Canada Place along the Burrard Inlet, to Cardero Street. 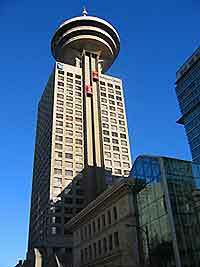 Historic Vancouver Block building, along Granville Street, built in 1912 measuring around 80 meters / 263 feet. 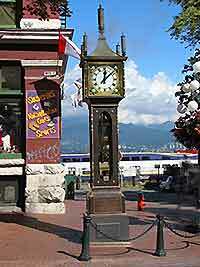 View of the city's famous Gastown Steam Clock, which features distinctive chimes on the hour. 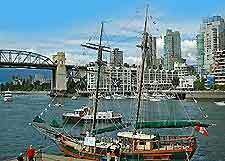 Granville Island area, where you can find fresh local produce at the public market, including seafood. 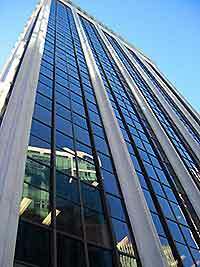 1977 Harbor Center building, one of the city's tallest structures, measuring 146 meters / 481 feet, with a popular revolving restaurant at the top. 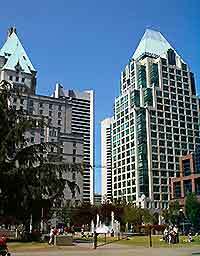 View of downtown Vancouver, which is filled with a variety of architectural styles. 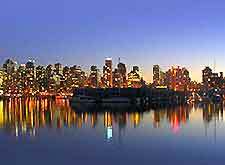 View of the city's impressive skyline as nighttime approaches, reflecting in the waterfront. 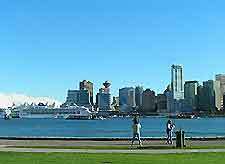 Skyline view from nearby waterfront parkland. 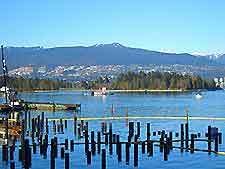 View of the city from Stanley Park, a vast parkland offering a host of recreational activities. 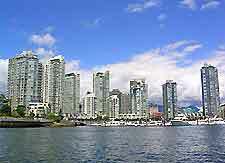 Yaletown district, a particularly fashionable area of the city, with a number of boutiques, restaurants and converted warehouses.